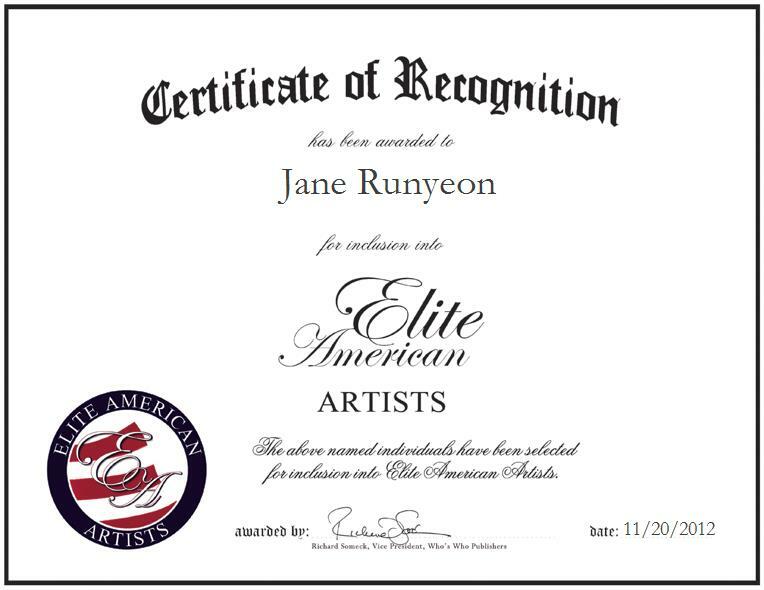 Company: All Together Art, Inc.
SHILLINGTON, PA, November 20, 2012, Jane Runyeon, President of All Together Art, Inc., has been recognized by Elite American Artists for dedication and achievements in the fine arts. For the past 25 plus years, Ms. Runyeon’s relationship with the art world has kept her on the move. As president of All Together Art, Inc., she consults with clients regarding their selection of art and she continues to exhibit every year. For a decade she taught as an adjunct professor at Albright College, and has served on the board of the Greater Reading Film Commission, the Reading Public Museum, and the Olivet Boys & Girls Club. She has an intern from Albright College working with her, and she is on the Albright Center for the Arts board. Ms. Runyeon has developed a new brand called It’s a Jane, making one-of-a-kind button bracelets. She is partnering with Room at the Inn, recycling and teaching women the cottage industry. And she is consulting: if an architect or chief executive officer is interested in fine art, she is brought in for budgeting and consultation on the acquisition of art work. Ms. Runeyon also works as a painter, in mixed media and with stained glass. Ms. Runyeon currently consults with clients regarding art and the selection of art for their businesses and homes, and as an investment. She holds a Master of Fine Arts from the University of Cincinnati, and completed independent studies at the Rhode Island School of Design. She became involved in her profession because she was educated by consultant Serge Sabarski, a German art dealer, on the sale of art. She also worked in a gallery and took a Dale Carnegie course about sales and what people look for. This inspired her to broker and consult in art. In the years to come, Ms. Runyeon will be getting out her first book about her career and will be finding a major gallery to show her work. She will continue consulting and painting and have a major exhibition.